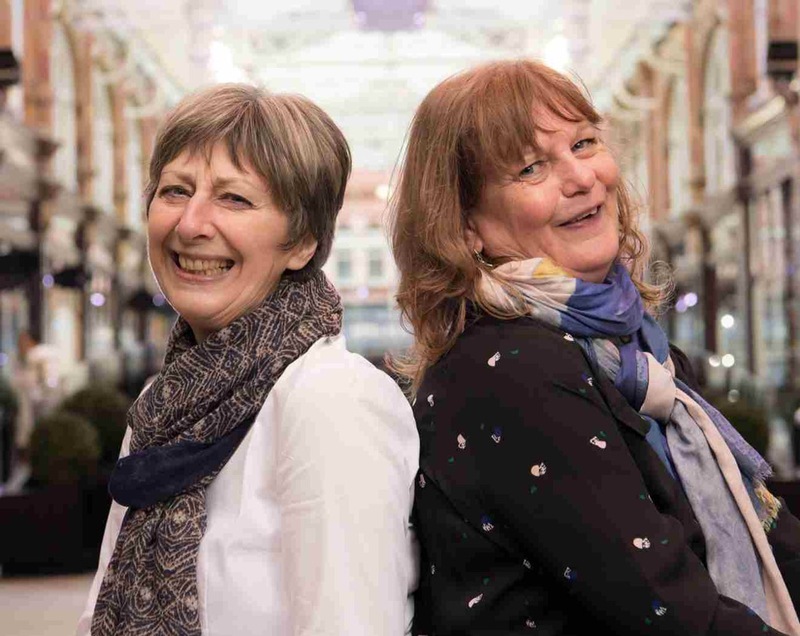 It seems absolutely ages ago that I was able to have lunch in real life with two smashing authors, Sue Featherstone and Susan Pape and I’m absolutely thrilled that today they are staying in with me to chat about one of their books, A Forsaken Friend which is published today. I’d like to thank fellow blogger and Random Things Tours organiser Anne Cater for inviting me to be part of this tour. It seems especially exciting to invite the ladies over to stay in with me because Sue and Susan are published by Lakewater Press and as Lakewater Press is two years old I’m interviewing their Director Kate Foster today too in a post that you can read here. Welcome back to Linda’s Book Bag Sue and welcome for the first time Susan.Thank you for agreeing to stay in with me. Sue: This was a no brainer: our new book A Forsaken Friend, which was published today (March 21). Don’t you just love the beautiful cover? Susan: It’s a sequel to our first novel A Falling Friend, which was published two years ago by Lakewater Press. Sue: We started writing together about 13 years ago, but we actually met when my youngest daughter was seven months old. She’s now 28 – so a long time ago. 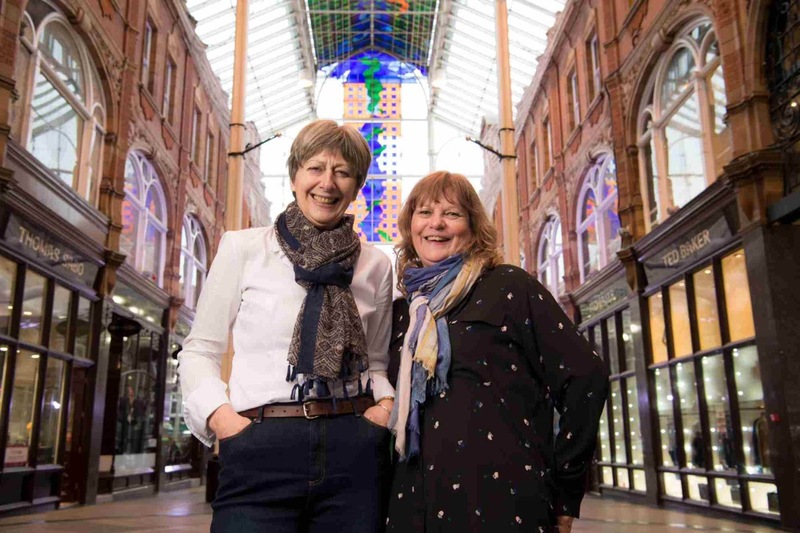 Susan: We were introduced by my then boyfriend, now my husband, who knew Sue was looking for a job share partner to work with her producing in-house magazines and video programmes for a privatised utility company. I was living in Wales at the time but wanted to return to Leeds so, since my background was also in journalism, he suggested we might be a match. Sue: We hit it off straight away and have been pals ever since. Susan: After five years, we both decided to move on and both ended up studying English Literature as mature students, before re-inventing ourselves as university lecturers. Sue taught journalism at Sheffield Hallam and I taught at Leeds Trinity. Sue: … so I went home and emailed four academic publishers and by teatime two of them had expressed an interest in seeing a detailed proposal. Susan: We went down to London to meet one of the editors and twelve months later, our first text book, Newspaper Journalism: A Practical Introduction was published by Sage. It was followed a year later by our second book, Feature Writing: A Practical Introduction, also published by Sage. And then, as one does, we decided to write a novel, which eventually, after a number of false starts, became A Falling Friend. Sue: We’ve just given the book a bit of a makeover with a lovely new cover to tie in with the release. I can’t decide which cover I like best. What do you think? What can we expect from an evening in with A Forsaken Friend? Susan: The Amazon headline describes it as witty and intelligent chic lit with attitude. I’m glad people think our heroines Teri Meyer and Lee Harper are spunky, funny and clever women, but since neither they (nor us!) are quite young enough to be chicks, we prefer the label #diva lit. Sue: Or even just women’s contemporary fiction. After all, we’re two women writing about the ups and downs in the lives of another pair of women. Men and jobs and family matter – and Teri and Lee have their share of fights – but their friendship is the backbone that enables them to take whatever life throws at them. Susan: Something which is true for very many women. Sue: A Forsaken Friend picks up where A Falling Friend left off: as the book opens things can’t get much worse for Teri. She’s lost her job at the university, as well as the regular allowance from her dad’s factory, and now her ex-best friend has gone and stolen her ex-husband! Susan: Teri decides to hell with them all and heads off into the countryside to spend some time at her brother’s smallholding where the gorgeous and god-like neighbour helps lift her spirits. Sue: …except for all the elephants in the room – Teri being the biggest – and not to mention Lee’s mother’s views about her dating a twice-divorced man. Susan: In other words, things aren’t as rosy as she first thought. So Lee’s beginning to wonder if sharing her life with a man is such a good idea. Susan: …and we realised we weren’t quite ready to let Teri and Lee go so we decided to move their story along. It took us eight years to write A Falling Friend – we were both working full-time and juggling busy lives – but we finished A Forsaken Friend in eight months. Susan: …it can be a bit frustrating, especially when I’m buzzing with ideas for our next novel which will be the last in the trilogy, but we’ve got a brilliant editor and copy editor, and the changes we’ve made at their suggestion have made A Forsaken Friend a much better book. Susan: …they always do. It’s lovely when an email pings into your inbox and the next chapter arrives and then, of course, we’re straight on the phone to each other. My husband says he always knows when I’m talking to Sue because of the shrieks of laughter from my office. What else have you bought along – and why? Sue: We’ve brought a selection of goodies: a bottle of wine, because, just like Teri and Lee, we like a good bottle of wine and, because I think you’ve said before that you don’t drink alcohol, a packet of my favourite China rose petal leaf tea from the world famous Betty’s tea room in Harrogate, and a box of their Yorkshire Fat Rascal scones. Susan: We’ve also brought a little photo album of some of the Yorkshire settings that feature in our books. We’re going to post the pictures on our blog so readers can see them too but, in the meantime, you can have an exclusive preview. Sue: And while you flip through the photographs, we’ll tell you how we make writing together work, how Twitter helped us find Kate Foster, our lovely editor and publisher, and why we avoid using the word ‘looked’. I’m always ready for a bit of gossip. Thanks so much to both of you for staying in with me to tell me all about A Forsaken Friend. I’ve really enjoyed it. I hope you have a wonderful publication day. A Forsaken Friend is published by Lakewater Press today, March 21 2018 and is available for purchase here in paperback and here in e-book. Their debut novel, A Falling Friend, published by Lakewater Press, has been followed by a second book, A Forsaken Friend, in their Friends trilogy. They blog about books here. 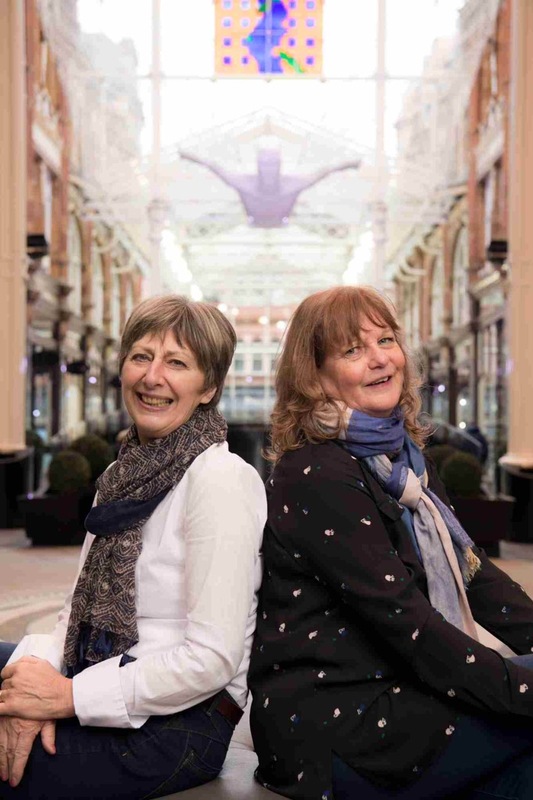 You can find both Sue and Susan on Twitter: @SueF_Writer and @wordfocus. Best of luck with the book! I enjoyed reading about the story behind the writing. Thanks for calling by lovely Jessie. What a fabulous ‘Staying In’ – one of the best so far! I’m glad you liked it Joanne. Thanks so much for calling by! My pleasure Susan. I hope we can catch up in person again soon. Have a lovely publication day! Oh, what a wonderful night in with two very interesting writers, Linda. Two lovely ladies I have had the pleasure of meeting in real life!